St. Patrick’s Day is one of my favorite holidays. I don’t really know why. It doesn’t have all the bells and whistles of some of the bigger holidays, but it’s just always fun. In high school, I loved it because it seemed to be one of the few days parents and teachers looked the other way while masses of kids ditched school and took the train into Manhattan to see the parade. Not coincidentally, it was also one of the few days that the NYPD seemed to look the other way when it came to drinking in public and/or underage. In college and in my twenties, it was all about partying in the Irish pubs in D.C. and N.Y. and it was always a blast. Throughout all those years though there was a quieter, more traditional, celebration with my family. My Irish-American mom would hang out the “Erin go Bragh” flags, bake delicious Irish Soda Bread, and we’d feast on corned beef and cabbage. It’s not much, but I always looked forward to it. These days, that’s more my speed. 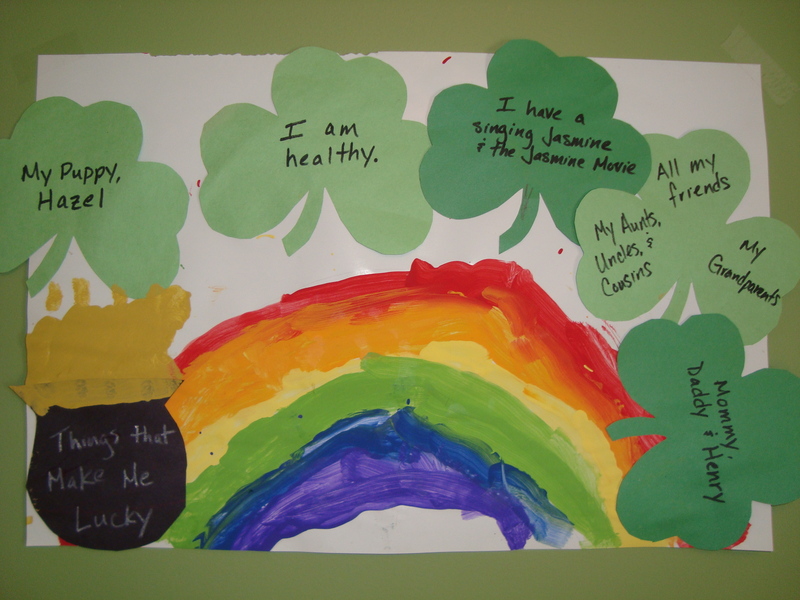 That, and a St. Patrick’s Day craft with Lilly. Maybe next year we’ll venture into leprechaun trapping, but for now I’ll share the makings of our St. Patrick’s Day so far. Here is the self-explanatory craft I made with Lilly earlier this week. It gave me a chance to discuss with her how lucky we are to have a happy, healthy family. Lilly felt particularly lucky to have a singing Jasmine doll and Aladdin. 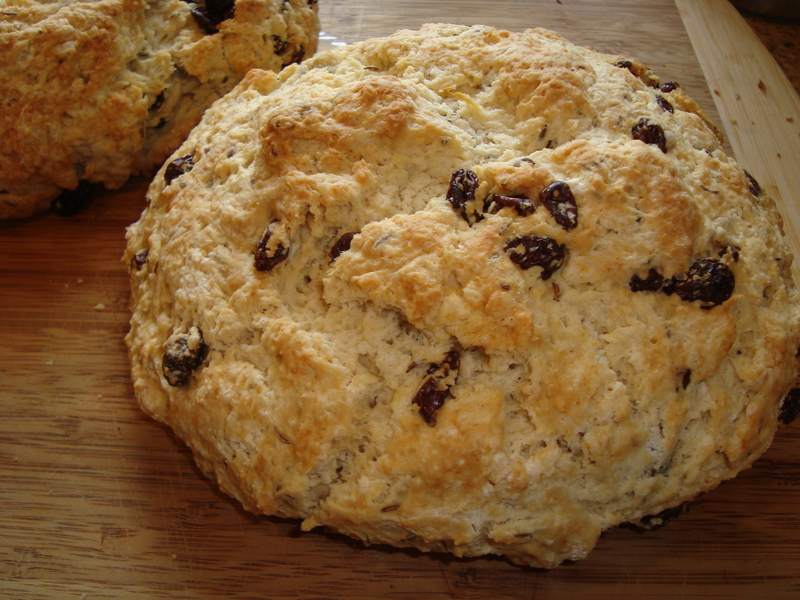 Today we spent the day making Irish Soda Bread using my mom’s recipe. This was the first time Lilly was old enough to really help with it and it was fun to pass on a family tradition that I enjoyed so much. It came out just like Mom’s — delicious. Mix dry ingredients in large bowl. Use knives to cut butter into dry ingredients. In a separate bowl, mix egg and buttermilk, then mix with dry ingredients. Coat raisins in some flour, then add raisins and seed to mixture. Split batter into 2 batches (or use as one large loaf) and mold them into large mounds. Place in center of a metal cake pan or metal bowl. Cut a cross into the top of each loaf. Bake at 350 degrees for 1 hour or until fork comes out clean. Finally, enjoy your bread with some butter and Irish tea! The St. Patty’s Day by MushBrain, unless otherwise expressly stated, is licensed under a Creative Commons Attribution-NonCommercial-NoDerivs 3.0 Unported License. Terms and conditions beyond the scope of this license may be available at mushbrain.net.